An odd looking squarely shaped structure stares back at you with its silver steel finished spherical, disk like ears (tiny antennae pointing out), illuminated red eyes, a green tubular throat, and a pipe like nose that pops out like a gun; whereas on the right side, the letter K and the number 9 are imprinted in a chrome finish. Yes, you guessed right…this is the robotic companion of the legendary traveler-the humanoid alien – Doctor Who, and is now available as a toy. Though the word ‘toy’ does not do complete justice to it. 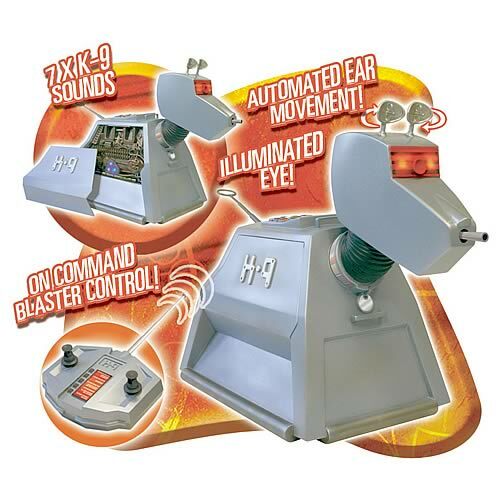 K-9 is the robotic canine companion of Doctor Who and accompanies the Doctor on his fantastic missions across time and space, fighting crime and evil villains. K-9 was created by Professor Marius on an asteroid near Titan. In the series, K-9 is a mobile computer which is highly intelligent, equipped with a large database, has highly sophisticated sensors, and a nose for an effective laser weapon. If you are a dog person and have ever dreamed of owning a pet, then K-9 is your canine. K-9, actually, does one better than our “real” furry friends. It does not need to poop, it does not need to go for walk two or three times a day, it does not need to eat, and most importantly it will not destroy or tear your precious belongings or articles. Wait… we haven’t yet told you the best part. This robotic canine companion is completely controlled by a remote control. The robot can cover a 360-degree range (back and forth, left and right), has automated ear movement, can produce seven different types of canine sounds, reproduce catch phrases made popular by the robotic dog in the show, and has sound effects such as Blaster FX. K-9 has all the love and none of the maintenance an actual dog would require. If you look at the K-9 objectively (Doctor Who fans can skip this portion), it is not without its flaws. The first thing you would notice while observing the robotic dog in action is that its movement is not smooth, rather it moves in a jittery, stop-start sort of a way which may not be pleasing to the eye. Another drawback lies with the remote control. The remote control has a long antenna, but the range is not very flattering. If K-9 goes beyond a few meters of the longish antenna, it stops responding. Though it has its drawbacks, the K-9 is a cute looking collectible that every fan boy of the Doctor Who series would wish to have and would be available at $64.99. If this was cool, make sure you also check out other gadgets like Lego Robot and Ball Balancing Robot.